HARARE – Zimbabwe has been plunged into a labour crisis of monumental proportions after senior doctors, nurses and teachers joined the ongoing strike by junior doctors which is now more than a month old. Nurses in the country’s public hospitals, as well as their counterparts in the education sectors, downed their tools yesterday to force government to improve their remuneration and working conditions. This is at a time the health sector is already crippled by an industrial action involving junior doctors. Specialist doctors from four of Zimbabwe’s largest referral hospitals and pharmacists were the first to throw their weight behind the strike by the junior doctors who are piling pressure on President Emmerson Mnangagwa’s administration to pay them in American dollars. In a statement, the specialist doctors at Parirenyatwa, Harare, United Bulawayo and Mpilo hospitals said they have resolved to withdraw their services until the standoff between their employer and the junior doctors has been resolved. “Following the continued industrial action by junior doctors and their subsequent suspension, we the senior registrars have become overwhelmed by the workload and are no longer confident we can discharge our duties properly without compromising both our and patients safety,” part of the statement reads. Junior doctors embarked on the job action last month, demanding to be paid salaries in United States dollars. They are also pushing for better working conditions and improved supply of critical medicines and equipment. Government has since suspended over 500 of them after the strike was declared illegal by the Labour Court. It has also vowed not to give in to demands to dispense their salaries in greenbacks, citing the unavailability of foreign currency. Mnangagwa was this week forced to cut short his vacation to attend to the crisis in the health sector after the junior doctors refused to back down from their demands. Apart from confronting the junior and senior doctors, Mnangagwa now needs to engage nurses in public hospitals as well through the Zimbabwe Nurses Association (Zina) and teachers after their professional bodies called on their members to down tools. 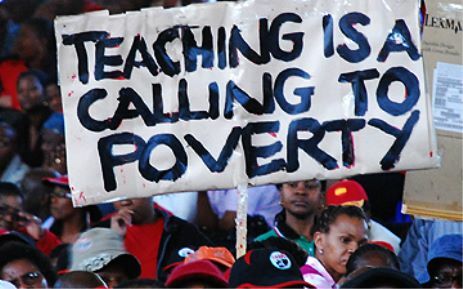 In a statement following a meeting attended by representatives from seven teachers’ unions and Zina in Harare yesterday, the civil servants announced their decision to boycott work. “As the education and nursing services sector, we have unanimously resolved that with effect from this day, 3rd January, 2019 … our incapacitated members will not be able to attend their normal duties for more than two days a week,” reads part of the statement. The meeting was attended by representatives from the Zimbabwe Teachers Association, the Progressive Teachers Union of Zimbabwe, the Teachers Union of Zimbabwe, the Amalgamated Rural Teachers’ Union of Zimbabwe, the Zimbabwe Rural Teachers Union, the Zimbabwe Democratic Teachers Union and Zina. As part of their grievances, teachers and nurses are also demanding that their salaries be paid in US dollars and that their bonuses incorporate allowances as opposed to a straight 13th cheque based on their basic salary only. They also castigated government for allegedly arm-twisting doctors using threats saying “we are in total disagreement with the government’s subtle and open threats against the doctors for embarking on legitimate job action”. “We are in total solidarity with the doctors and all medical personnel currently on job action. If the government harasses any of the health and education services members, the concept of injure one, injure all will immediately kick in,” the government employees warned. Zina said several meetings with government representatives to iron out their differences have failed to yield results. Government has started the year on a bumpy note with its employees embarking on industrial action over poor salaries. The opposition MDC led Nelson Chamisa has also cranked up the heat on Mnangagwa with threats to march to State House to demand his resignation on account of failing to stabilise the economy. Chamisa has publicly backed the striking doctors, urging government to pay them in US dollars since most basic commodities are now being charged in foreign currency. However, government insists that it is not in a position to meet the demands by its workers citing a critical shortage of foreign currency. The authorities have gone further to suggest that there was a political hand behind the industrial action aimed at toppling Mnangagwa form power with the help of civic society and MDC. But the doctors maintain that theirs is a genuine call for government to consider their welfare. “All our grievances are driven from a point of need. There is nothing political about asking your employer to improve the conditions of service and your welfare,” the Zimbabwe Hospital Doctors Association said. The doctors added that they have no capacity to stop any individual from showing solidarity with them since it is a national problem hence of interest to the public. What are the options for Chamisa, MDC? “vowed not to give in to demands to dispense their salaries in greenbacks, citing the unavailability of foreign currency”. Errr! yes, but foreign currency can be found to build a NEW CITY !!! And don’t tell me it won’t need any.